As Hassan Rouhani continues to receive support from reformist leaders, the battle unfolds between him and the hardliner’s candidate, Ebrahim Raisi who has now joined forced with Tehran Mayor, Mohammad Bagher Ghalibaf. 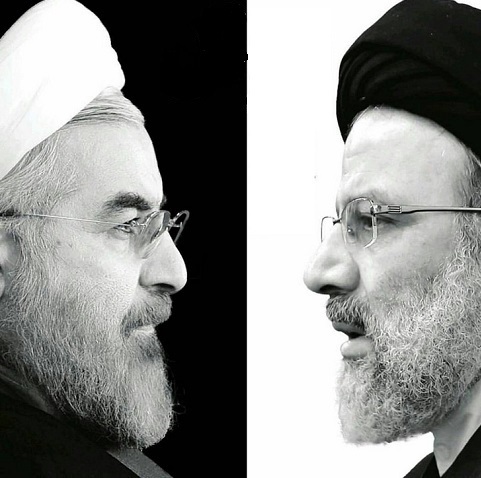 Hassan Rouhani (left) and Ebrahim Raisi (right) are the two main rivals of Iranian presidential election. In the meanwhile, Hardliners are attacking Rouhani accusing him of abusing power to purchase his residence in Tehran lower than the market price. They are also spreading rumors about Rouhani’s son death, who died some twenty years ago. Iran Green Movement leaders Mirhossien Mousavi and Mehdi Karoubi have announced their support for the re-election of Hassan Rouhani. Speaking from house arrest the two leaders extended a firm endorsement for the current government in Iran. The reformist Mohammad Khatami, the fifth President of Iran, has also sent out a video message urging voters to vote for the current president. Eshaq Jahangiri, senior vice-president under Rouhani and a reformist candidate in the current presidential race has dropped out of the race saying that he will dedicate all his abilities to support Rouhani in the election. The reformists support for Hassan Rouhani who in the first round of elections in 2013 was running a campaign based on non-radical moderate values, has polarized the 2017 election in Iran. Negative campaigning has become the norm of this election and both main candidate, Hassan Rouhani and Ebrahim Raisi are viciously condemning each other. Media organizations affiliated with Iran’s hardliners, like Tasnim and Fars, have published rumors about the current president’s son death twenty years ago. The official narrative is that Rouhani’s son committed suicide but the hardliners are saying Mohammad Fereydoun, Rouhani’s son killed himself with his father’s personal firearm. They are calling for an investigation into his death. In the meanwhile basiji plainclothes forces have attacked a number of Rouhani campaign centers in cities of Tehran, Mashhad, Qazvin, Babolsar and Isfahan. On Monday 16 May, Tehran Mayor Mohammad Bagher Ghalibaf dropped out of the election. In his withdrawal announcement Ghalibaf said he stands with the hard-liner Ebrahim Raisi. The two of them are now campaigned together and are mainly criticizing the current government on economic grounds: both in terms of its corruption and in terms of voters’ living conditions. On 16 May, Raisi said that the Rouhani administration do not recognize the fact that there is a recession. Ghalibaf and Raisi are also calling the nuclear dead ineffective, arguing that it has not increased the flow of foreign investment. President Rouhani has also taken stance against his opponents in the coming presidential elections saying they are supporters of execution and oppression. In harsh words against his opponent, Ebrahim Raisi, Rouhani said that the people will not back those who support executions and oppression and those who oppose women’s. Raisi in 1980s Iran was with the Judiciary and a member of the Death Committee that extralegally executed more than 4000 political prisoners. Rouhani addressing crowds at his campaigns has said that the significance of the vote in the last election was that the people showed they do not support violence and that they were against house arrests and the isolation of the country. Rouhani described the 2017 campaign as the continuation of his last campaign. He slammed the principalist (conservative) representatives saying their operating word is “ban” and all that they have practiced has been in the service of limiting people’s freedoms. He went on to criticize the Mahmood Ahmadinejad administration that held power for eight years prior to the reformist victory in 2013 and said his current opponents were all from the same camp. Rouhani spoke of the inefficiency of the last administration leading to the squandering of billions in oil revenues. He accused the former administration of laying off 860 thousand women and creating an oppressive atmosphere in universities. Under the Ahmadinejad administration and following the controversial 2009 elections that millions of protesters said were rigged, many progressive lecturers were laid off from universities, activists were arrested and jailed and widespread anti-women policies in public workplaces as well as in general were put into action.